The AIPAC sponsored bill that guarantees $38 billion to Israel over the next ten years is a dramatic departure from the deal offered under President Obama’s 2016 Memorandum of Understanding (MOU). Passed by the House of Representatives on September 12, 2018, the United States-Israel Security Assistance Authorization Act of 2018 effectively rolls back every limitation that President Obama placed on the amount of aid we give to Israel. In addition, the House version provides Israel even more perks than the version passed by the Senate on August 11. Most dramatically, this new act would eviscerate the ability of President Trump and his successors for the next ten years to withhold United States aid to Israel. Historically, almost every president since Eisenhower has attempted to withhold such aid at one time or another in order to force Israel to the peace table or to stop Israel from committing human right abuses or illegal acts such as taking Palestinian land and giving it to Israeli settlers. In an unprecedented gift of our executive power to Israel, the House has passed for the very first time a law that forces the American president to give Israel a minimum of $3.8 billion per year. We have, in effect, crippled our ability to promote US interests in the Middle East. President Eisenhower was the last American President who managed to use this threat effectively, when he forced Israel to withdraw from Egypt’s Sinai Peninsula in 1957. The second most important effect of this act is in Section 103. While the MOU limits the amount of aid we give Israel to the amount agreed upon, in this case $38 billion over 10 years, Section 103 of the current bill removes all limitations on how much we give Israel. Under the new act, instead of 38 billion being the cap, as Obama stipulated in his 2016 MOU, we must now give Israel a minimum of $3.8 billion per year until 2028. Without a cap, and with incessant lobbying by Israel and her proxies in the United States, the amount we give could conceivably double over the next 10 years. This is a huge coup for Prime Minister Netanyahu and quite a slap in the face to the Obama administration. Section 106 will increase Israel’s access to a war-reserve stockpile by completely removing the limits on how many precision guided missiles we can give Israel. The existing law set a maximum of $200 million worth of arms from the stockpile per year, to be charged against the agreed aid package. The House version of the bill differs from the Senate version, replacing the words “sell” and “sale” to “transfer,” which appears to open the door for more gifts in excess of the $38 billion. To put this in context, a Tomahawk Missile currently costs about $1 million. The media recently lambasted President Trump for using 60 such missiles in Syria because of the high cost. Section 107 calls on the President to prescribe procedures for the rapid acquisition and deployment of precision guided munitions. The House text differs from the Senate version in that it removes all the detailed requirements for Israel to have such rapid acquisition. In the version just passed by the House, there is only one, extremely broad requirement, that Israel is under direct threat of missiles (in Israel’s opinion). Section 108 of the Act authorizes Israel to export arms it receives from the U.S., even though this violates U.S. law. The Senate version included a provision calling on the President to make an assessment of Israel’s eligibility before adding Israel to the exemption list. The House version deleted that requirement, and simply orders the American President to grant Israel the privilege. In fact, Israel is ineligible, having repeatedly made unauthorized sales in violation of this Act. The Export Act further forbids granting such an exemption to any country that is in violation of International Nuclear Non-proliferation Agreement, which Israel has refused to sign. Israel is known to be in possession of nuclear weapons, and hence in violation and ineligible for the export exemption. Congress thus reiterates the message that it will force the President to continue funding Israel even when that violates our laws. In the past, Israel has spent 40 percent of U.S. aid on Israeli companies, at the expense of U.S. industry. Under Obama’s 2016 MOU, this percentage was to be decreased over the 10-year span, and eventually Israel’s unique right not to spend use U.S. military aid to purchase items from American companies was to be ended. The new Act eliminates this requirement, putting Israeli economic interests before our own. Many in Israel criticized Prime Minister Netanyahu for his aggressive attempts to undermine President Obama’s Iran deal, fearing that it would anger the White House and result in a less favorable aid offer. Analysts were particularly worried about what might happen if Trump were elected, since in 2016 he had said that he expected Israel to pay back the security assistance it receives from the US. The bill now will go back to the Senate for approval, and then to Trump to be signed into U.S. law. The $38 billion package amounts to $7,230 per minute to Israel, or $120 per second. And that’s before Israel advocates and ambitious politicians in our own country push it even higher. Nicole Feied is an American writer and former criminal defense attorney, currently based in Greece. 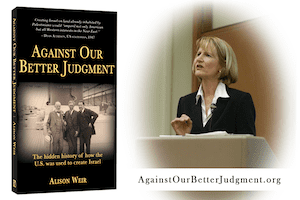 Alison Weir also contributed to the article. Americans who wish to object, may contact their Congressional representatives here. Informational cards to distribute about the bill, containing the top image, can be downloaded here. 1. The bill was timed to be introduced just before AIPAC’s 2018 annual conference in Washington D.C., so that delegates could lobby their representatives while they were in D.C.